Second graders Junior Edmond, Miles Biglin, and Alessandra Martinez in Julia Melville’s second grade class at F.K. Sweet Elementary are using base ten blocks while learning to subtract with regrouping. 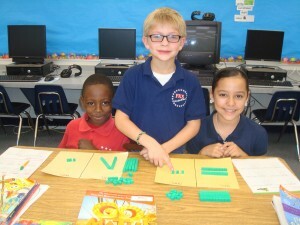 Go Math emphasizes the daily use of manipulatives to help students use a hands on approach for mastery of math skills. The Rivers Edge Elementary student canned food drive was a huge success! The food was distributed to many families and everyone was grateful for the help during the holiday season. Pictured, from left, are students from Sandra Foley’s fourth grade class Esbeydy Dumas, Pasquale Giallongo, Derrick Brooks, Kayla Mayes and Megan Dugan. 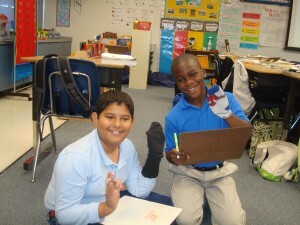 Jonathan Colon and Bakari Mosley, fourth grade students in Kim Yoder’s class at F.K. Sweet Elementary, are working together on solving long division problems with remainders. What’s with the socks? It is an easy and fast way to wipe the white boards after checking over their work. 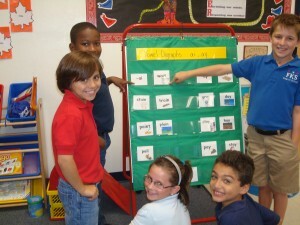 Second grade students in Traci Lott’s class at F.K. Sweet Elementary are busy identifying vowel digraphs at a word work center during the Daily Literacy Routine. From left, Dylan Rizzo, Preston Zinter, Benjamin Nissinoff, Abbey Brosnihan, and Feliciano Jean are enjoying working together as a team. 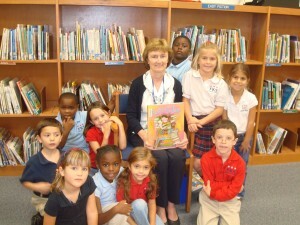 Do you have fond memories of sitting in a circle and being read to in the school library? Not too much has changed as kindergartners prepare to listen to a new book, Library Lily, read by F. K. Sweet Elementary school media specialist Jeanie DuPell. The student council of St. Lucie Elementary recently held a food drive to benefit the Harvest Food and Outreach Center. Jakob Warren, Ramon Aguilar and Yasmin Enriquez from Holly Stephen’s first grade class proudly display canned goods their class collected. Students in Andrea Porte’s third grade class at St. Lucie Elementary had a good time reading their favorite books in their pajamas at the Positive Behavior Support Reading Camp-In. Enjoying their books, from left, are Lizbet Venegas, Ryan Maldonado, Kendrick Bailey, Henry Jones, and Isabel Maldonado.